From what others have told me, and of course from my own experience, I have learned that everyone, without exception, has a hard time in middle school. And for many, high school is not much better. As the years go by, you look back at those years of insecurity, terrifying change, and seemingly relentless unkindness from others and for a moment you feel so grateful that you are not in that situation anymore. But there is another truth that I'll bet we all share. When you got out of that emotionally turbulent state, and learned that there was kindness in the world, and a sense of belonging, and a lot of fun to be had, you owed it all to one person, didn't you? It started with one friend that saw and loved you for who you were, regardless of all those parts of your soul and body you were sure made you a loser. One friend saved you first. At least I know that's what happened to me. As I read the first act of Angela Day's debut novel The Darkest Lie, I saw a bit of my young self in Thane Whitaker, a high schooler in the fictionalized town of Payson. Thane's one rule for himself, his personal Magna Carta, is to never draw attention to himself, to move as silently and invisibly as possible between his abusive home and his clique-centered high school. This all changes when Remi, the pretty and infectiously spunky new girl in town, befriends him. And her timing couldn't be better because Thane, in a freak accident, discovers he possesses magical abilities he cannot control. Before long he is awakened to the existence of elves and dragons and fairies in the world and he is soon whisked off to a military unit in charge of magical control and peace-keeping called Sanctum. 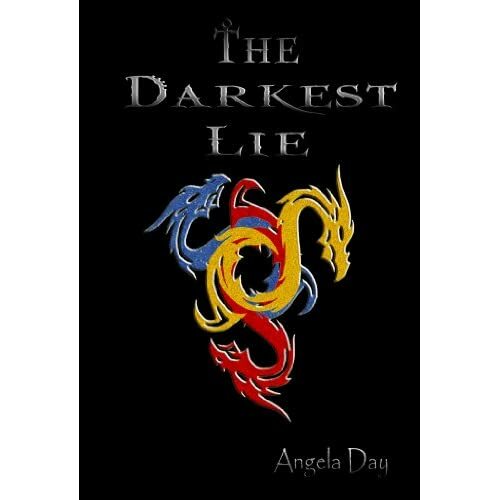 The Darkest Lie is an engaging, fun, and action-packed read that holds its own in the stylistic and structural ballpark of many popular young adult franchises of recent years. The novel alternates between witty dialogue and fast-paced action as Thane is hurled from his dismal adolescence into a hurricane of new information. Day paints a vivid picture of Sanctum as a sort of mix between Rowling's Diagon Alley and Charles Xavier's school for the gifted, full of strange mythic creatures but also commandos, hackers, and spies. Not all of the characters we meet get a lot of paperback real estate, but I think we can safely assume that many of them will be developed later in the trilogy. A lot of the fun of the book springs from the diversity of races (real and imaginary), dialects, character ticks, and backstories. It is a rich and highly detailed world that Thane stumbles into. The sincere and entertaining friendship between Thane and Remi is the glue of this story, much in the same way that the Harry/Ron/Hermione dynamic was the anchor of the Harry Potter universe. But lest you think there's too much Harry Potter comparison going on here, I should mention that Thane and Remi are unique and individual creations and make for relatable and interesting protagonists very much in their own right. Remi, in particular, immediately won my love as she stirred up memories in my heart of old school friends who never thought themselves too cool or too pretty to hang out with me. At the core of this fantasy is Thane's coming-of-age story, and I think it's a timely variation on the classic hero's journey. Rather than proving himself to others, or defeating an Evil Something, Thane becomes a hero as he learns to accept the light as well as the darkness within himself, thereby learning to accept the good in the world around him. I imagine that young readers who come from difficult homes will identify acutely with this book and find solace and encouragement in its pages. Day does not shy away from the heaviness of what a rough family life can be like, but doesn't make it hard to read either. The central message of the novel is one of hope, and it is conveyed in a very uplifting way. Highly recommended.